Happy Saturday, blog friends! I hope that you are having an awesome weekend so far! Today I wanted to pop in and share some cards that I've created using the Pinkfresh Studio Holiday Vibes paper collection. We introduced that we will be offering our paper collections for sale on our website now in bundle form! And we are kicking it off with Black Friday savings on the Holiday Vibes bundles! Now thru Sunday at 11:59pm CST, use the code HVIBES50OFF to get 50% off our Holiday Vibes bundles - we have three options. 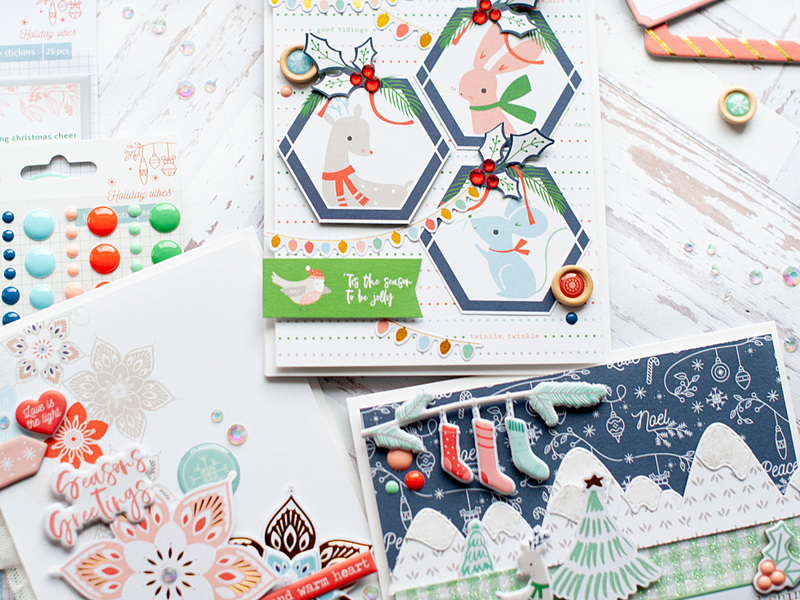 There is an embellishments bundle, and then you can add the 12x12 paper pack or 6x6 paper pad...or grab all three! Just be sure to use the code upon checkout - that is the only way to get the 50% savings! You may not know, but I started out in this industry as a scrapbooker. And while my scrapbooking style is a little rusty, I do still love creating with paper & embellishments...and hope to showcase this style more from now on. 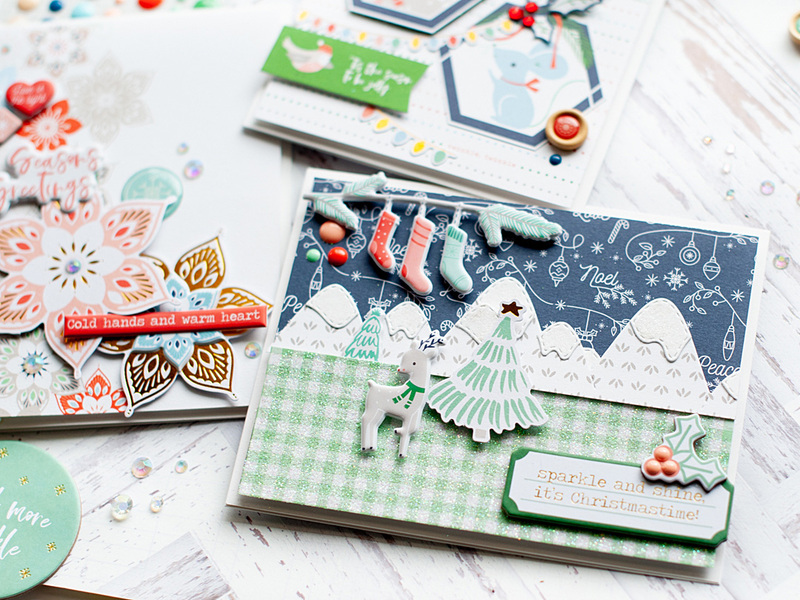 So for today I created three super fun cards using the Holiday Vibes collection without any stamping! There is a little diecutting on the card with the mountains, but other than that it is all elements from the collection and some fussy cutting! 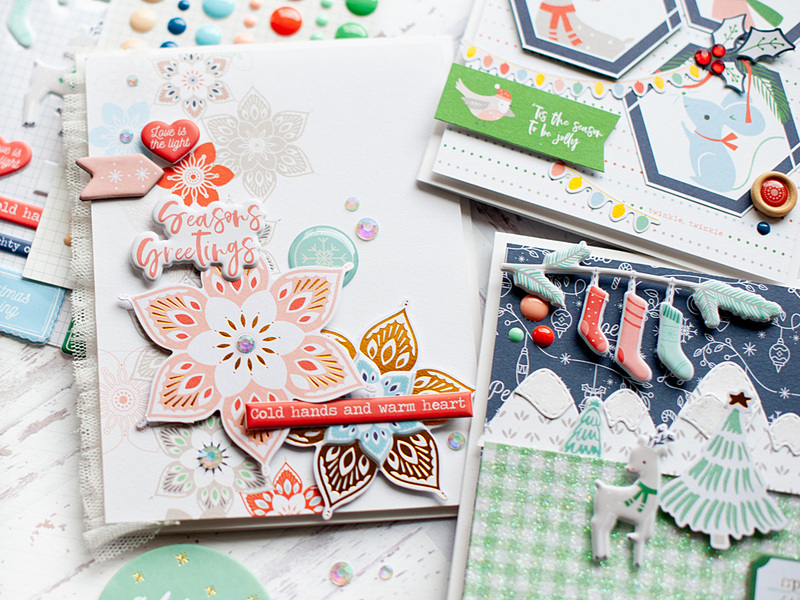 With scrapbooking style, it is a little harder to write up tutorials on how to create the cards. It is mostly just following your intuition & style on where you want to place and tuck things. I have individual images of each card below, and I will try to give a brief overview of how I created it! For this first card, I used the border of snowflakes on the 6x6 paper, and just started building the card up from there by adding some diecut snowflakes, puffy stickers, epoxy badges and a chipboard arrow. I accented with some iridescent flat backed jewels. I did add some ruffled tulle to the left side of the card to give it some added texture & femininity. For this card I built a scene first from some of the 6x6 patterned papers. I diecut the mountains using a WPlus9 die, and layered them together. I glittered the strip of paper that is meant to be the ground to make it feel a little bit icy or snowy. Then I just layered everything to an A2 card base, creating this sweet wintry scene. For this final card, I fussy cut the hexagons & holly leaves from 12x12 paper, then layered the card as shown. I used some diecut ephemera for the holiday lights, then tucked some wooden buttons & enamel dots here & there. The final step was adding some red jewels to the holly berries! I hope that you like my fun Holiday Vibes cards! Be sure to grab the Holiday Vibes bundles for yourself at this great Black Friday Sale pricing of 50% off! 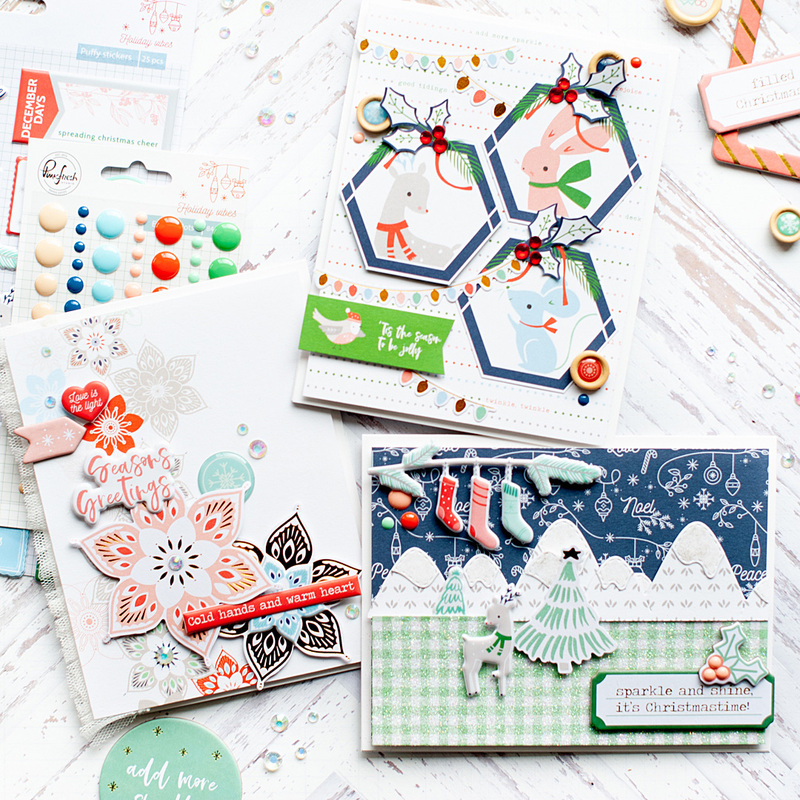 This collection is so fun & whimsical, and you will love it for your traditional layouts, cards, mini albums, December Daily & so much more! 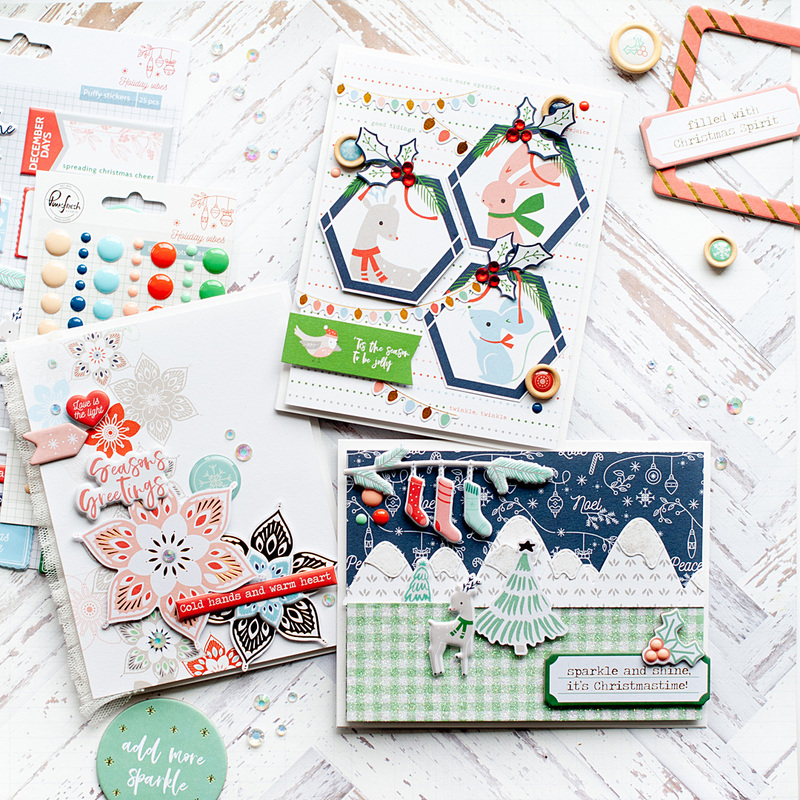 And while this is definitely a Christmas themed collection, there are many elements with a wintry feel that you will be able to use well into the new year. I hope that you have a wonderful rest of your Saturday! Oh wow, these are just adorable!! !